Get ready to show off some serious skills in your kitchen! We partnered with chef Alex Tso to show us the three knives he thinks everyone absolutely must have in their kitchen, how to use your knives, and how to hone them to keep them sharp and long-lasting. You’ll also hear exactly what you use each knife for, as well as important tips for safety, efficiency, and comfort while using your knives. 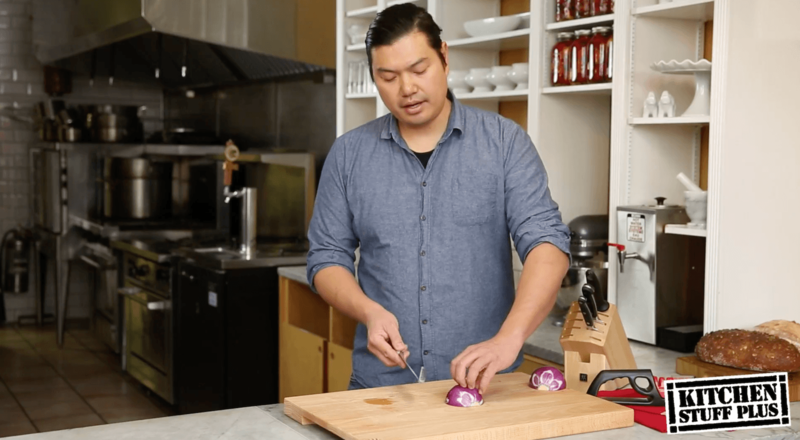 Whether you want to learn how to perfectly dice an onion, why a bread knife is a must-have, or how easy and important it is to hone your knives, you can watch a professional chef break it all down for you. When you have the right knife for the right task, cooking is so much easier and lot more fun. You’ll feel so much better with a fully stocked set of knives to do half the work for you! The ZWILLING J.A. Henckels sale is on at Kitchen Stuff Plus from March 25 through April 22, 2019. Save 30% off all open stock knives, including the chef knife, paring knife and bread knife shown in the video. Visit the sale at ksp.store/henckels to see all the amazing offers, including great gifts with purchase. Want to read more about knives? Check out our recent posts or connect with us on Instagram at @kspstuff for any other questions and be sure to show off your new, amazing knife skills as a fancy new home chef.